Well-known motorcycle manufacturer Yamaha and French luxury fashion house Hermés have joined forces to produce very unique concept bike named VMax. The bike features rich leather detailing added to the seat, headlight cover, exhaust silencers, grips and mirrors against a chrome frame. 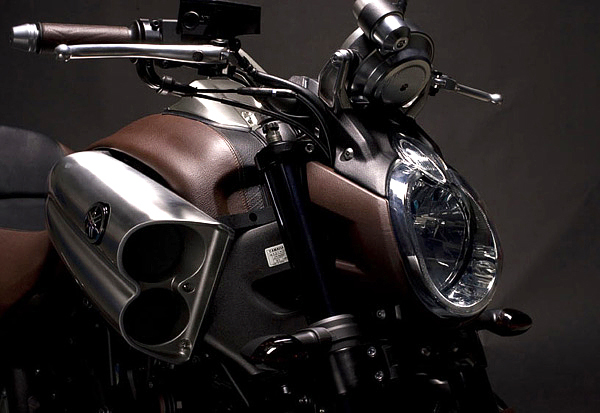 Yamaha and Hermes have combined “mechanics and leather, to fulfil the dreams of motorcycles.” The idea was, according to Yamaha and Hermés, to “Reinforce the sculptural lines of this unique object and underline its emotional power.” VMax is just a concept and exist in a single copy.